MANAMA, Bahrain: I was walking with Youssef Gaigi, a friend of mine, past a Pakistani in Dubai in late February 2005. I saw some guys hitting their chests and chanting and I wondered what was going on. I entered the area, and asked the security guard what was going on. He told me this was the holy month of Muharram, where Shi’a Muslims commemorate the death of the Prophet’s family. I took a very well hidden video and left. We continued walking home and I heard a speech coming from the Iranian school. I entered the area, the only white person in sight, and stood in the middle of thousands of people watching large screen. Youssef, a Sunni, stayed back with great fear. I heard just enough (sorry, I don’t speak Farsi) to note that the lecture was partly on America and the influence in the Islamic world. I went back home that night and started asking around about Muharram until a friend of mine, Ali Shirazee, told me much more about it. He also told me that in Karachi it is even more intense, something that I had to see. With haste I booked my ticket and applied for my visa. With great distress, I didn’t get the visa and didn’t go out to see any more activities that year…. In 2006 I was accepted to start AIESE in Bahrain, a majority Shi’a country, and one of the first things I said was, “I am going to see Muharram the right way this time. “Here is my very brief account, all from memory, all from the heart……..” Muharram is the first month of the Islamic calendar (in Islam they use the lunar calendar, and thus it doesn’t correlate directly with any Gregorian month). 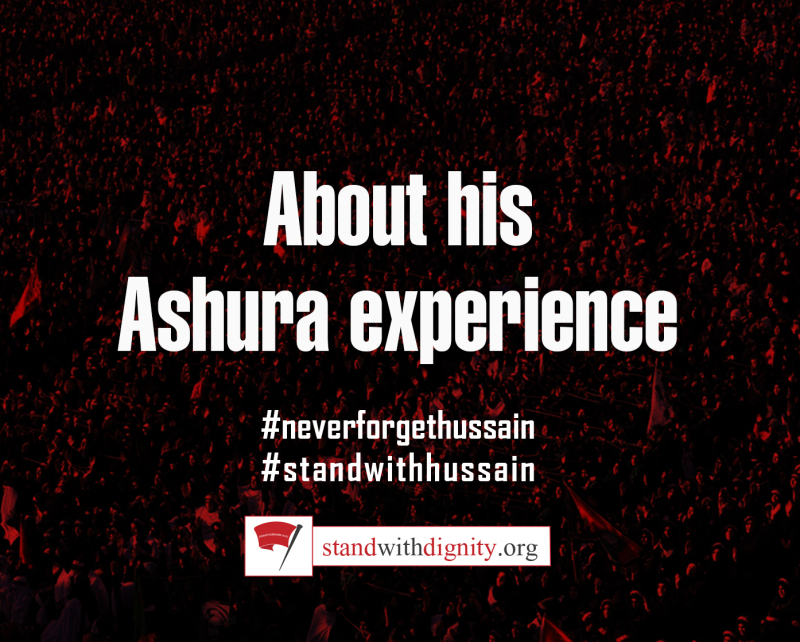 Ashura is the 10th of Muharram, a commemoration of the day when Imam Husain (a) and his family (grandson of the Prophet Muhammad) were slaughtered brutally by the army of the Caliph at the time (Yazid) in the year 681 AD (I believe). 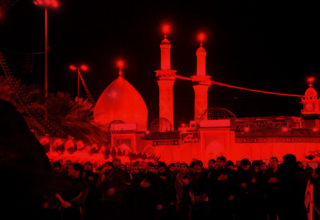 This year the first of Muharram fell fairly close to the first of February. Muharram is known to be spectacular in many cities, some in Syria, Lebanon, Karbala (Iraq), Iran (although it is quieter there from what I can gather), Karachi (Pakistan), and perhaps the most well-known and largest open gathering, in Bahrain. 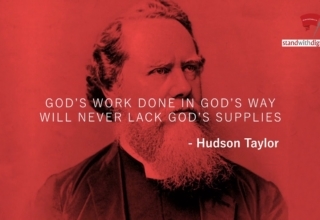 These past eleven days have been something incredible, regardless of whether you can appreciate it as a religious mourning, historical commemoration, or cultural spectacle. 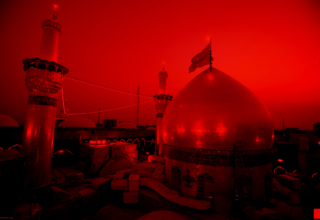 From a religious standpoint, it is considered by many Muslim to be the time when the great Imam Husain (a.) with 60 of his followers met the evil Caliph Yazid’s army of (some say) 30,000+ in Karbala. More importantly at this point in time, Islam had been lost by the greed of tyrants and the present Caliphate was not what had been intended by the holy Qur’an. 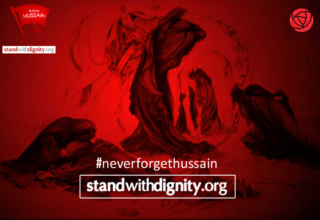 Husain (a.) had the choice to stand up against Yazid and die to bring renew the true teachings of the Prophet Muhammad, or run away and live. Naturally, his choice was the difficult one of death and for this he is considered by many to be a most important Martyr, and the only one capable of sustaining the true Islam. As a historical commemoration, the first twelve days of Muharram depict a great struggle between two powers of nowhere near relative equality. The powerful capital of Syria had been taken over in a sort of Monarchy against the decree of the past Caliphs of Islam. The throne, the wealth, the power and reign over the region had been taken by Muawiyah instead of the Prophet’s family. So a second capital city of the region, and of Islam, was created in Kufa (Iraq) with the Prophet’s family regaining power and respect of the followers of Islam. The two powers the vast ancient state of Syria rich in material possessions (including land, an army, millions of people, etc.) and the newly founded Kufa with spiritual guidance were at odds with each other. More correctly said, Syria saw Kufa as a natural threat and enemy and made a quick strike to wipe out the city, the followers, and of course all bloodlines of the Prophet Mohammed (s.a.) Husain was in Medina (Saudi Arabia) and got word of the coming invasion, and thus made a long trek with his small group of followers back to Kufa. 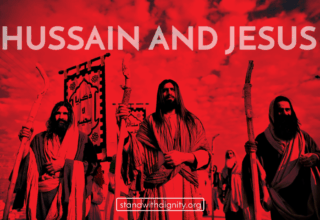 In Karbala Yazid’s army blocked his camp in and killed each and every member, lead all his horses over the slain Husain beheaded them, and marched with their heads on spears back to Syria. They were received with content by Yazid, to see his only major threat in the world wiped out in one quick fight (the 10th of Muharram, Ashura). As a cultural spectacle Muharram focuses on religion and history to tell the story, and to feel the suffering and pain of that fateful day some 1,400 years ago. As my only definite example, Bahrain is nothing short of wonderful during these days, every night for 10 days there are events ranging from information and historical lectures (Aza), to readings from the Qur’an, to plays and parades on the streets, to a ceremonial march where all men firmly place their right hand on their chest in unison (called Matam, it is a way of feeling for Husain when his chest was trampled by the horses from Yazid’s army). The first few nights were rather small, and offered the perfect chance to learn. I had the chance to meet Dr. Sheikh Ali Misbah Yazdi from Iran (studied at the University of McGill in Montreal, has a very great worldview reflecting mostly on society related to religion) and ask many questions on Islam and Muharram. His lectures were in English each night of the first ten days of Muharram; his flyer is the photo below. The parades, Aza and the Matams were much smaller; people were out on the streets, but not in such large numbers (in other words, I could still walk as I pleased). Each night the events get progressively bigger and more intense, not to mention thousands of more people from all over the world enter this tiny island. Somewhere around the 7th of Muharram the nights turned from interesting and informative, to completely packed (meaning you can’t walk hardly anywhere downtown, naturally right next to my flat). The marches on the street (Aza) and the lectures (Matam) filled the city with noise and life from around 6 pm until as late as 1A.M. The last few days’ things began to change. This is when you really start to sense the progression from preparing for something to the event itself. The night before Ashura is when everything picks up. Parades on the street depicting the historical and religious events start everywhere(especially in the villages of Bahrain), Matams become more and more intense with more people and some even have actors representing Husain’s followers and Yazid’s armies. The Aza’s sometimes get so large and intense that with the chest thumping, at times you can’t hear the singing of the leader. Most of the Pakistani groups raise their hands far up into the sky and bring it down as fast as they can beat directly to their red chest making such vigor it sounds like hundreds bass drums being hit at once. Admittedly most of the groups are more respectful of their bodies. Some of the Persian groups have procession that line multiple streets, with thousands of people (and hundreds of children) all with a handful sized small gauge chain they lightly tap to their chest, then back together. Another very interesting aza I saw was of all the Bahraini Sheikhs. 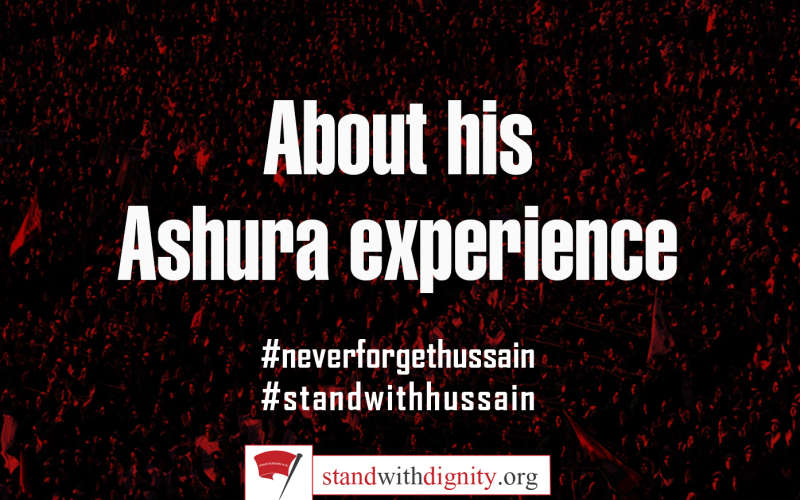 I can only assume the knowledgeable leaders of Islam are the ones, if any, who are commemorating the death of Husain in the most appropriate way. They had a very gentle, old man singing, “Aiwa Husaina, Aiwa Husaina, “while all sheikhs gently, noiselessly, touched their chest. The year before this procession didn’t happen due to a bomb threat. Needless to say I enjoyed this one the most, but was very nervous of my surroundings. Of note, there was no violence, nor did I ever feel any threats of danger during the entire week. I went out wearing all black (as everyone does, imagine being in a funeral with hundreds of thousands, perhaps millions of people that last for 10 days). I didn’t take advantage of the free food and drink. I asked questions and met Bahraini’s and Persians to show me around and guide me. I listened to the Matams both in English and in Arabic, and most commonly the only white person, or non-Arab in the Matam or area. I even felt the pain the crowd felt, and came very close at times to crying with them. Had I understood Arabic (and thus the content), or was someone who was actually capable of crying in public, I would have lost it without a doubt. Political protests followed the Bahraini way, make your point, but no violence. There mentions during the Matams about America, the invasion of western values, even about the terrible cartoons of the Prophet Muhammad, but never was there anything more than just words. There were US and Israeli flags painted on the ground so that people can walk over them and over time the paint comes off. I am certain this was the first time there were also Danish flags. Everywhere I went, of course, I introduced myself as American, and never did I have a bad reception. Often people were so glad to see someone not listening to the Media and government and learning about Muharram instead of being scared that they showed me around and nearly force-fed me food and drink. On Ashura, just after noon (the time when Husain (a.) was slain and the armies left for Syria), I visited the village of Sanaabis. There I saw Matam bin Khamis (link, they have live and recorded videos, photos, information, etc, but only in Arabic so far, link for the live video). It was the most emotional lecture I heard this year, I don’t think there was a dry eye other than mine, and I guarantee that if someone splashed water on my face you would swear I was crying too. Next there was parade on the street of all the corpses, and Yazid’s army with dozens of heads on their spears. Again, people all around me were swelling at the eyes. Needless to say I had an amazing experience. For what I might have lacked in spiritual connection, I made up with informational gathering. I have made lists and lists of questions, met with Dr. Sheikh Yazdi in person, made contacts in all sorts of societies, had private tours of the Matams, and have at least 3 months’ worth of readings to go over on Islam and Muharram. A few nights ago someone asked me, “So Eric, what do you do?” Since my work in ALESEC is so difficult to explain, I got smart and said, “I enjoy every minute of life and take advantage of every experience I can, always learning as much as possible”. With no regrets, with no judgment or bias, I feel very good about my life right now. My experience in Muharram and openness to learn is yet another reason why in life you have to see everything and not listen to forecasts and people’s assumptions (especially not those who are just sharing what they have heard from others). Thanks for reading.